There isn’t a single “magical dog food” out there that is good for every dog. Just as it’s the case with humans, some dogs thrive on foods that would make other dogs sick. It’s all about finding the right dog food for your particular pooch. That is why it’s essential to read as many dog food reviews as you can when trying to decide which one is the best way to go as far as feeding your dog with nutritionally rich food is concerned. That being said, we do believe that there are brands that are just better than most. If you go for the cheap, bottom-of-the-line brands, you will most likely find that their dog foods are full of fillers that provide no nutritional value to your hound. We make it a point only to feature the best dog food brands in our reviews. 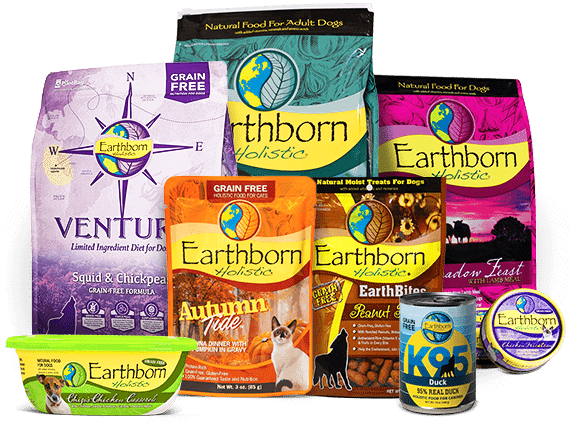 EarthBorn is one such brand that puts out excellent dog foods for canines of all shapes and sizes. This EarthBorn dog food review will give you an idea of what kinds of recipes this company has and which types of foods are best for which breeds of dogs. EarthBorn Holistic Dog Food has been a trusted dog food brand since the very beginning of the industry itself. History tells us that the dog food industry came about around the 1920s and 1930s. Midwestern Pet Foods, the company that owns EarthBorn Holistic Dog Food was founded in 1926. Based in Evansville, IN, this company has grown into one of the most trusted brand names in the industry today. EarthBorn Holistic Dog Food prides itself in producing nothing but holistic dog food. What this means is that the company believes your dog’s health is intrinsically linked to its nutrition. As such, they only produce foods that will promote your hound’s health in one way or another. They, therefore, only use ingredients that serve a specific purpose and their foods have absolutely no fillers. Widely hailed as the “gold standard” of EarthBorn’s dog food roster, the Earthborn Holistic Primitive Natural is a well-balanced food made with nothing but high-quality ingredients as is the norm when dealing with EarthBorn. The grain-free formula used in making this food has an impressive amount of protein that comes from an excellent assortment of chicken meal, whitefish meal and turkey meal. It also boasts a wonderful balance of vitamins as well as other minerals that mostly come from plant sources and a few supplements. This food has a lot of protein and fat which means that it’s particularly good for very active dogs. While that combination also makes it suitable for any dog that needs to develop lean muscles, this food might not be very good for dogs that have low activity levels. If you have a very active hound, even working dogs, then this is the right food for them. Apart from making holistic foods for grown dogs that need energy, EarthBorn also makes foods for puppies that need to grow up to be big and strong. The Earthborn Holistic Puppy Vantage is a food that is designed to give your puppy everything that he/she might need in their journey towards adulthood. This meal is packed full of protein which comes from whitefish meal and chicken meal while the carbohydrates come from a wonderful blend of barley, sweet potatoes, oatmeal, and brown rice. All of these ingredients are carefully chosen to ensure that they are easy on puppies with delicate stomachs. Unfortunately, this meal might not be the best for large breed puppies because they have a slower growth rate which calls for a different nutritional approach. Earthborn Holistic Great Plains Feast uses lamb meal and bison to get a majority of its protein. Additionally, it contains a decent amount of pea protein and peas which ensures that it is loaded with plant-based proteins for your mutt to enjoy. Because it doesn’t contain as much protein and fat as the Earthborn Holistic Primitive Natural, this food is more suitable for a wider range of dogs including the not-so-active ones. In most cases, you will find that this food is perfect for every kind of dog, not just the highly active ones. EarthBorn Holistic Dog Food continues to produce nothing but the best. This list gives you three excellent alternatives for all kinds of dogs.